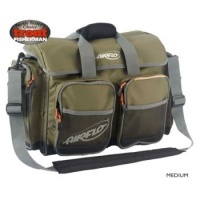 The Airflo Fly Dri Carryall is the true definition of quality design meeting purpose. Unique nylon coated PVC tarpaulin makes for not only an extremely hard wearing and rigid bag, but also waterproofing to keep whatever you keep inside dry in any weather. The entire Fly Dri range is impressive with superior build quality and the same waterproof qualities coming as standard. The main compartment has a staggering 20L capacity in the ‘Medium’ size. 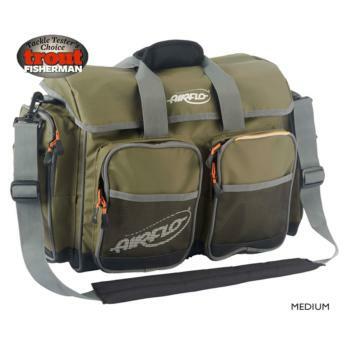 Easy to carry, we would recommend this bag to boat and bank anglers alike - the rugged underside and waterproofing mean that you could confidently keep this in the hull of the fishing boat and know your gear is dry and where it should be.We also have incorporated wet pockets so if you want to put wet gloves, a hat or whatever in your bag, you can without affecting the rest of your fly fishing equipment.